In 2011, Longbranch condos for sale replaced the boiler and went solar. The new system heats water for the 60 condos and the pool and spa, and will save money for Longbranch owners for the next 20 years. Built in 1974, the condo complex is slightly unusual sitting next to historic homes in the same block. Only three stories rise above ground, and the lower level is entirely reserved parking for the residents. The homes are arranged around a central courtyard, and the complex has a pool, spa and electronic entry system. The new solar system heats water rather than producing electricity and is extremely efficient. The construction cost will be paid off in five years from set asides for electricity payments, and didn’t require an assessment of the property owners. The managers of Longbranch live on-site. Along with the technical improvements, the exterior was upgraded, and improvements were made to the common areas and lounge. Discover current Longbranch condominium listings found below, or find out more about this popular condominium complex. 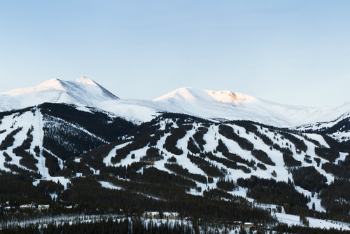 Being one of the few multi-story buildings on the east side of Main Street, many Longbranch condos for sale will have a great view of the Breckenridge ski area, Baldy Mountain, or long views toward the Williams Fork Range. This condo complex is conveniently situated a few short blocks from Main Street on Wellington Road, which is the north end of the core of Breckenridge. So from Longbranch, it’s a short walk to the gondola and City Market. A bus stop on the northwest corner of the property makes it easy to get anywhere from Longbranch. Sq. ft. liv. area : 534 sq. ft. to 1904 sq. ft.
Longbranch Condominiums are located on the corner of Harris and Wellington near the historic district, across from Father Dyer Church. From the traffic circle on the north side of Breckenridge exit the roundabout to Main Street and turn left at the first light on to French Street. Continue around French Street for three blocks and turn left at the first stop sign onto Wellington. Longbranch will be on the right. 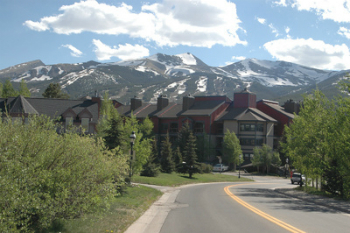 Contact us to discuss real estate opportunities in Juniata, or other Breckenridge neighborhoods.